January 12, 2018, 12:00 P.M.
SDA & SCA Students, Faculty, and Staff ONLY. Third annual SDA/SCA mixer for students and faculty! The opportunity to network (and eat!) will be preceded with special 'Spotlight' guest - Shohreh Aghdashloo. 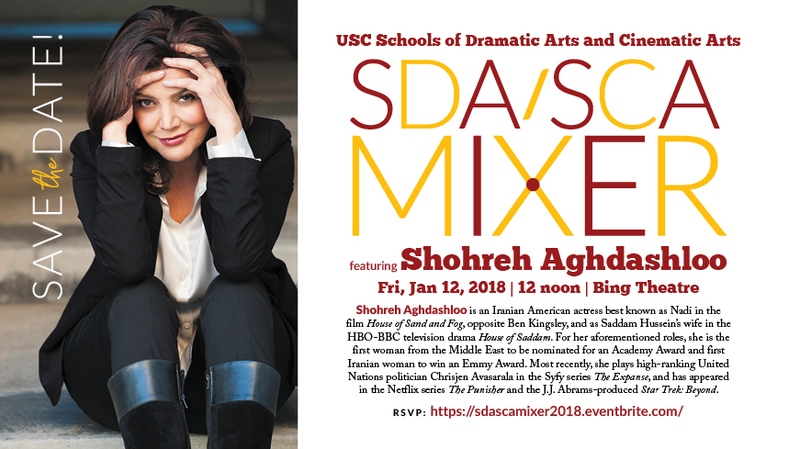 Shohreh Aghdashloo is an Iranian American actress best known as Nadi in the film House of Sand and Fog, opposite Ben Kingsley, and as Saddam Hussein's wife in the HBO-BBC television drama House of Saddam. For her aforementioned roles, she is the first woman from the Middle East to be nominated for an Academy Award and first Iranian woman to win an Emmy Award. Most recently, she plays high-ranking United Nations politician Chrisjen Avasarala in the Syfy series The Expanse, and has appeared in the Netflix series The Punisher and the J.J. Abrams-produced Star Trek: Beyond.